Hay refers to the cut and dried grass, alfalfa, straw, legumes, and other herbages in large round bales. They are abundant on farms and in forests. Hay is usually used as animal feed or bedding for cattle, horses, rabbits, sheep, etc, as well as biomass fuel for burning, heating, and cooking. Hay pellet fuel generate 90% less greenhouse gases than fossil fuel like coal, only 1/10 that of EPA requirement. Hay pellets have the heat value of nearly 8000 BTUs, almost equal to hardwood and close to that of coals. Its energy transformation ratio is as high as 20:1, compare with 10:1 of wood, and 5:1 of biodiesel. So hay pellets are an ideal heat source. Hays are a common waste on the farm and in forestry. They are cheap and easy to get. It only takes 70 days to grow a crop of grass, much quicker than the growth of wood and crops. Thanks to low cost of raw materials and production, hay pellet fuel has price advantages over traditional fuels. The pellet price is 225USD per ton, while petroleum takes about 1000USD per month. Using hay pellets for heating and cooking can greatly save your fuel cost. Hay pellets can be used as mulch and soil conditioner in garden and farmland. They can expand to 4 times their original size when wet. And their ash after burning can be used as fertilizer. Hay is a common animal feed, but it has many defects. Hay supply is rich in summer and short in winter. Haystacks take up too much space. Some hays are too rough to eat directly. Making hay into pellets can solve these problems. During hay pellets production, the high temperature and pressure will promote the starch gelatinization in hays, and make it easier for animals to digest. Hay pellets tastes better than hays. Livestock eat more and grow faster. Hay pellets only take up 1/4 the volume of haystacks, so it can save storage and transportation cost. The feeding process also become simpler, famers can achieve intensive and mechanized husbandry. Hay stacks usually have ash deposits. 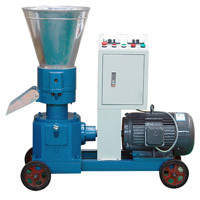 The hay pellet production can remove the ash and improve the cleanliness of food. How to make hay pellets at home? Crush the hay into powders with a hammer mill. For making pellets, the size of raw materials should be 3-5mm. If the hays are too large to feed into the hammer mill, you need a feed grinder to reduce the length to under 10mm. Dry the hay powders. For making pellets, the moisture content should be 14%-20%. Hay, especially fresh hay, usually contains high moisture content. They need to be dried by an airflow dryer. Also, you can dry the uncrushed hays by spreading them on the floor. Make hay pellets with a pellet machine. Feed the hay powders into the pellet machine hopper. The high pressure and temperature will mold the powders into high-density solid pellets. You can add some additives or mix it with other biomass materials to improve the molding rate or nutrition content. Cool down the pellets with a counterflow cooler. The pellets are hot(about 85℃) when they come out from the pellet machine. A counterflow cooler can lower the pellets temperature to 35℃, and increase their hardness at the same time. The cooled pellets can be packaged into bags for storage, transportation and selling. Hay pellet machine is the equipment to make hay into pellets. It can also process crop straw, rice husk, grass, alfalfa, leaf, sawdust, and wood chips. You can mix hays with other ingredients to improve the nutritive value. TICO hay pellet machine adopt flat die design. It features simple structure, small size, high mobility, and easy operation. It is suitable for small-scale production for farmers and home users, as well as wood pellet manufactures. The gearbox adopt bevel gear drive, with high efficiency and long working life. It is made of gray cast iron, with low noise and good cushioning effect. 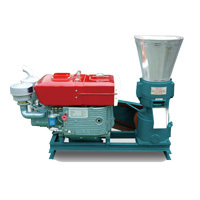 The pellet mill die and roller is made of superior alloy steels whose hardness is 55-60HRC. The die has achieved the best compression ratio base on plenty of experiments. So the forming rate is high. TICO hay pellet machines have obtained CE and ISO9000 certificates, and have been exported to many countries all over the world. If you have need or want to know more about the price and specifications, please message to us in the form below.